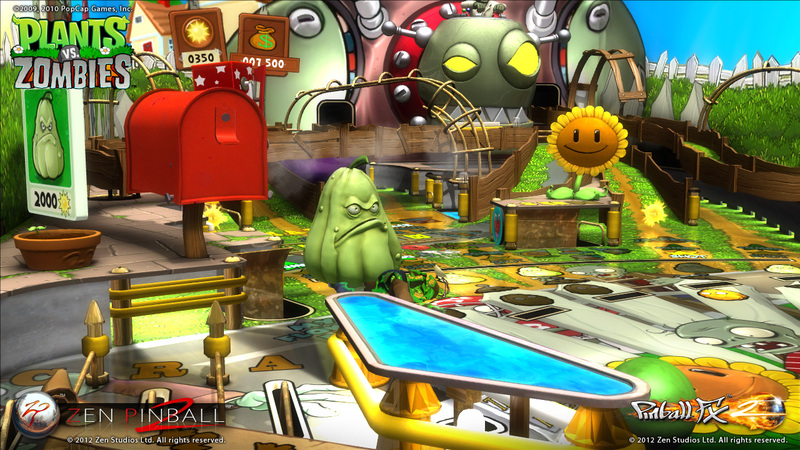 Plants vs. Zombies* is available as a $2.99 USD add-on for the excellent arcade pinball simulators from Zen Studios–Zen Pinball 2 and Pinball FX 2. Please note that tables purchased for the PS3 can also transfer to every other PlayStation device (including PS4). Each table is enhanced with robust social features encouraging leaderboard competition and personal improvement. This–along with a highly detailed “Operator’s Menu” that allows you to do everything from change the slope of a table to its overall difficulty–make Zen Pinball 2 and Pinball FX 2 some of the best digital pinball experiences to date. 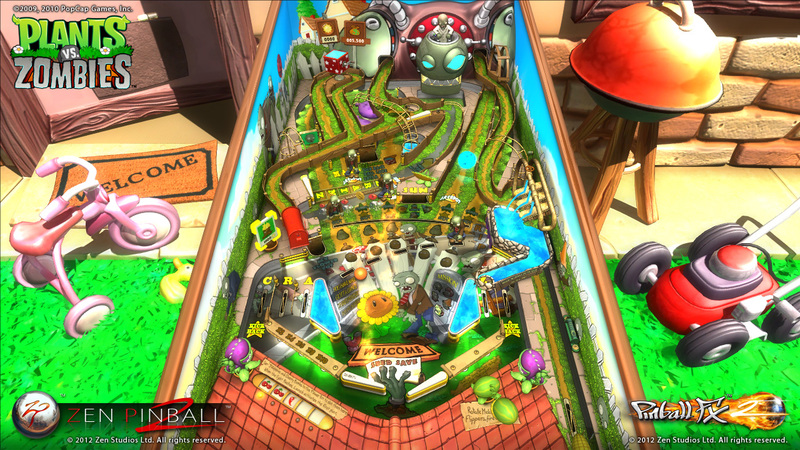 Zen Studios’ Plants vs. Zombies pinball table manages to successfully transfer the family-friendly tower defense insanity of Plants vs. Zombies into a pinball format. Through expert use of official artwork, designs and music, this table feels just like the original game. 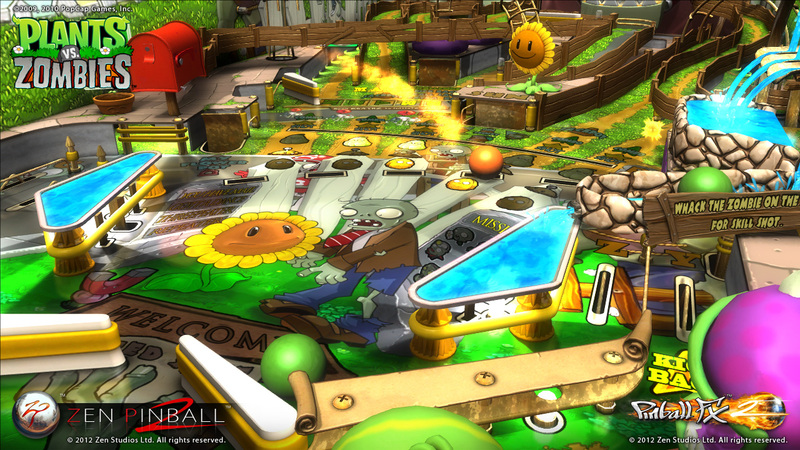 Plants vs. Zombies and pinball share the same basic objective –survival. Let the zombies reach your Welcome Mat or too many balls “drain” and it’s game over. Use Sun to buy a variety of helpful plants like the “Squash” and “Torchwood” to keep those zombies off your lawn! The oddly-lovable Squash protects vulnerable areas of your defense. A flaming “Torchwood” ball can destroy helmeted zombies with a single hit. Among the official elements included in this table is Crazy Dave’s Twiddydinkies. 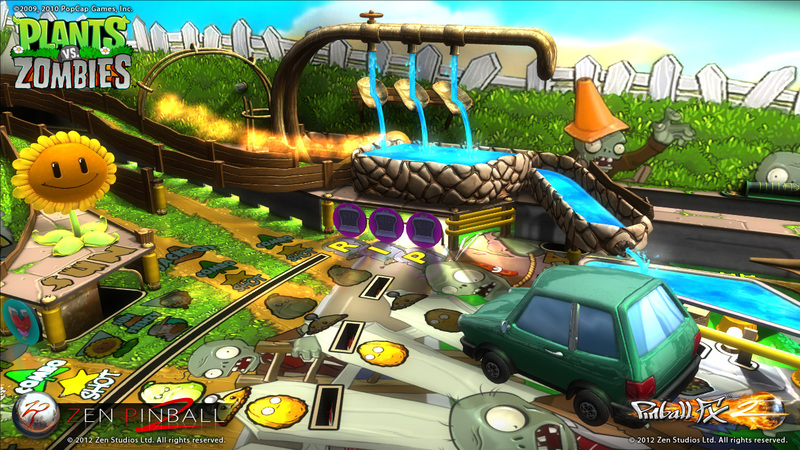 Players use his shop to buy items like Bacon or the Gatling Pea with coins earned from defeated zombies. 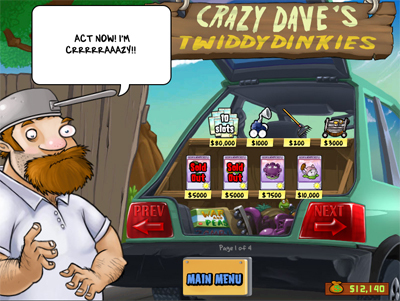 The original Crazy Dave’s Twiddydinkies (his car trunk). The pinball Crazy Dave’s Twiddydinkies. 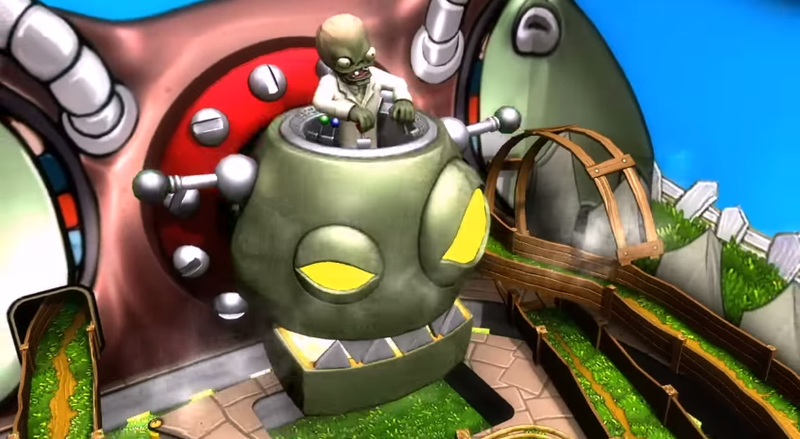 Despite being based on a child-friendly property, Plants vs. Zombies features a balanced difficulty that makes challenging Dr. Zomboss (ruler of the zombies) quite an achievement. 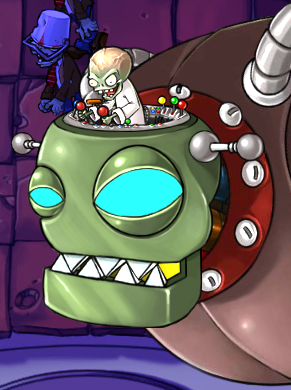 Dr. Zomboss in the original. 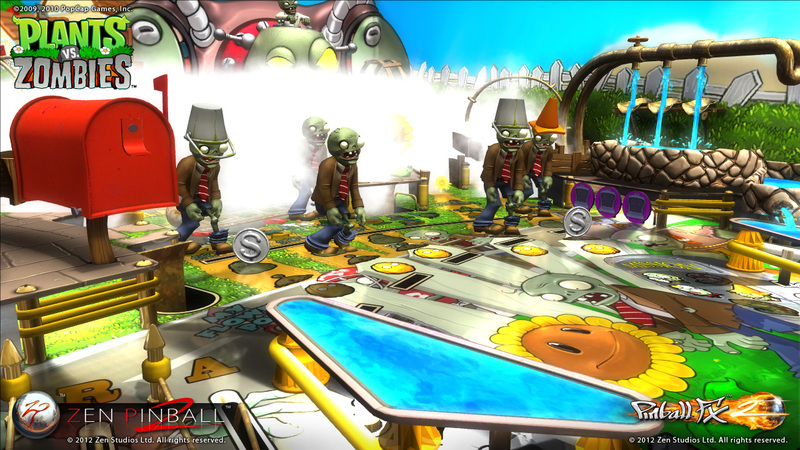 Dr. Zomboss in the pinball table. 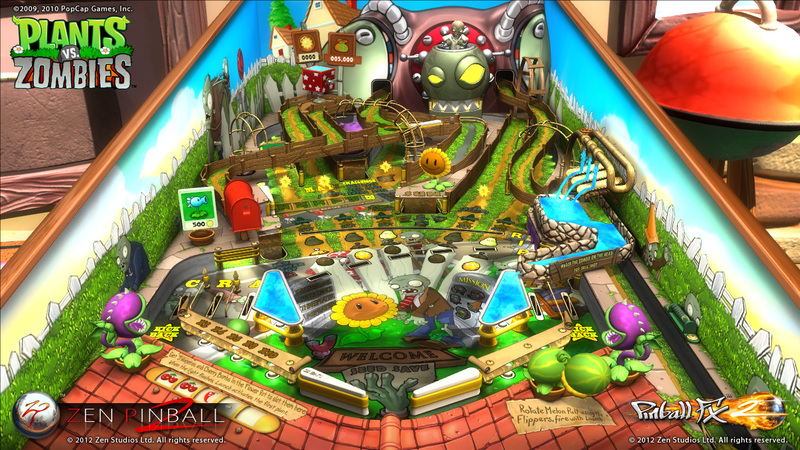 With its use of official assets and the signature charm of the original title, Plants vs. Zombies makes a fantastic pinball table. The inclusion of cartoon zombies. The player can use the elemental effects of fire and ice by planting Torchwood and the Snow Pea, respectively. The main antagonist (Dr. Zomboss) can use these abilities as well. This title is available for a wide variety of platforms–from the PlayStation Store to the PC–so remember to check the digital store of your choice. *This table was received for review. See our statement of ethics here and game review criteria here. This entry was posted in Uncategorized and tagged Bible, christian, christian gaming, christian review, christianity, gaming, God, Jesus, KJV, Pinball, Pinball FX 2, Plants vs. Zombies, Plants vs. Zombies pinball, review, salvation, video game, video games, video games and the Bible, Video Games and the Bible Highlights, Video Games and the Bible Reviews, videogames, Zen Pinball 2. Bookmark the permalink.